My Grandpa’s name was Pike, yes like the fish or the Peak, however, his name has nothing to do with either. He was originally given the nickname Spike because of his small stature as a kid. Spike eventually became Pike because one of his younger siblings could not pronounce it correctly and from then on he was known as Pike. I was probably well into grade school when I learned that was a nickname and not his given name. Grandpa Pike was one of my heroes in life. He was amazing, although not in the sense that celebrity is created in today’s standards though, he was amazing in his honesty, his candor, and his love of life. I mean he would not score a reality tv show, he would be too mundane for today’s audiences; he was too stable, too authentic, too grounded for anything like that, for instance; he did not have an alcohol problem, he didn’t use drugs, and he wasn’t a philanderer. Good grief what so amazing you’re wondering? Grandpa seemed to go through life effortlessly making everyone else feel like a star in their own show. He never seemed to need, want or desire to be the star, the center of attention. He taught me so many things without me realizing he was teaching me anything. I learned how to live from Grandpa, not just survive, but live. He was a great man; he loved his wife, his girls, his grandkids, he loved family in general, he could fix anything, build anything, and he absolutely loved the latest gadgets. He worked hard, but not too hard, there was always time for fun and our fun was; a family picnic, fishing, traveling, and treasure hunting (dumpster diving). At Grandpa and Grandma’s house we always sat around the table to eat our meals, no tv, just conversation. We would talk about ideas, inventions, tell stories and cook up schemes. We were always coming up with better ways to do things and then Grandpa would take these schemes or ideas and go out and tinker with them in his garage. My brother is much better at this than I am, but we both see simple solutions to problems, that much to my amazement others do not seem to see. I know this is from watching Grandpa tinker and invent things in his garage. Grandpa Pike taught me to fish, I do not fish as much as I did when I was young, but when I do it brings back those wonderful feelings of being with Grandpa and just having fun. I still have his rusty old tackle box, it is a well used vessel containing various implements, including recycled ammunition used as weights, all intended to seduce the local gill bearing aquatic animals to give their life so we could eat, and I cherish it. When grandpa taught me to fish it was to bring supper home, I still am somewhat baffled by the catch and release mentality, although I have a raised a daughter that is solidly of that ilk. The first time we caught some rainbow trout, my favorite, and cleaned and ate them right there in the Black Hills, she was appalled, and I seriously wondered where I went wrong. Grandpa was a master carpenter, he completely remodeled his house with the help of his brother, my uncle Mack. Holy cow uncle Mack was crazy tough, he could drive a nail into a board with his fist, he would wrap a handkerchief in his hand place a nail between his fingers and drive the nail into a 1 x 4. He loved to demonstrate that ability when poked and prodded by his nieces and nephews to do so, his lovely wife Dot did not seem as impressed by this feat, as the rest of us were. He was a gigantic chiseled piece of granite and yet as soft and cuddly as a teddy bear, all at the same time. Pike and Mack worked together and transformed my grandparents house, it was amazing to watch, they never fussed about us kids being under foot, we were always given meaningful jobs to help out. I think that comes from the two of them growing up on a farm in a family of 13 kids and everyone had to help out, even the youngest. Grandpa had the biggest garage I had ever seen at that point in my life, he built a 14-foot high garage with a 12-foot door and attached it to the little one car garage that was original to their single story house. It stuck out like a sore thumb in their subdivision, and it was his sanctuary. He had more lumber than Lowes stored in that baby, along with all the interesting treasures we would discover on our frequent trips to the dump. Every time we went to the dump we would end up bringing more stuff back than we took, my Grandma would tell Grandpa, “now Pike don’t bring a bunch of stuff home with you, like last time,” as much as Grandpa loved and respected Grandma he never listened to that particular advice. I felt like a treasure hunter when we went to the dump. Nowadays you can’t take things home from the dump, which even as I type that I realize how funny that sounds, but it was common place back then. I love to watch American Pickers because my Grandpa was the original picker to me and taught me to be a picker at a very young age. Grandpa’s problem was that he did not sell as much as he picked. 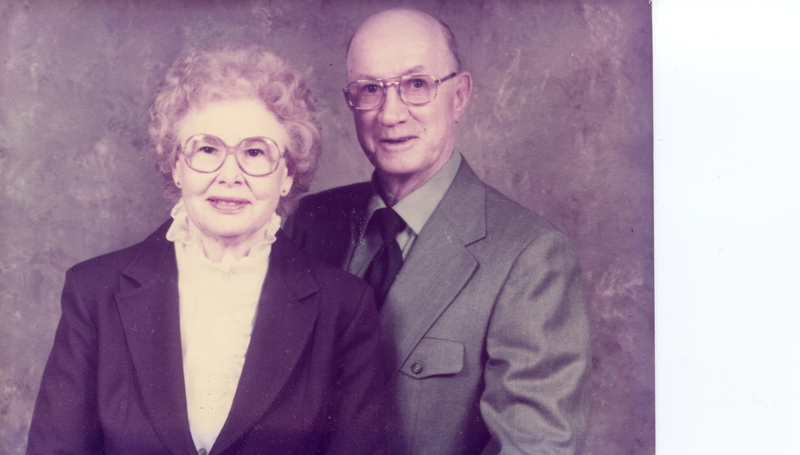 Later in their lives my grandparents retired from their “careers” and started their own business, a clothing consignment shop, Grandpa practically built everything in the store; the shelves, the dressing rooms, and the display cabinet. We all worked in the store and helped out. It was an amazing education which I did not fully appreciate until much later in my life. People from all walks of life came to the store either to sell or buy clothes. Ocasionally someone down on their luck would come in and ask for clothes for free, Grandma always obliged. My grandparents never judged the customers and we were taught all of them deserved respect. I was taught how to make change, price merchandise, and prepare bank statements, I ran the store on my own at age 13, my daughter will be 13 in two months and I feel a sense of sadness that she will not be afforded the same opportunity. Grandpa and Grandma taught me financial responsibility at a very young age. It’s still difficult for me to pay full price for anything and to this day I love to shop at consignment shops, Goodwill and antique stores. It’s funny I know a lot of people complain they get overwhelmed when they walk into Goodwill or other second-hand stores, I get nostalgic and feel right at home. My grandpa was the kind of guy that loved innovation and technology, when color tv’s came out he was the first one to have one. I remember when he got a microwave it was the first one I had ever seen and I thought it was the coolest thing ever. I used to melt shredded Colby cheese on a paper plate and I would eat that big slab of melted cheese with scraps of paper plate still attached. I thought if this is all this magical box can do it has fulfilled its purpose in life. And yes I found out the connection between overindulgence in cheese and the interruption in the natural digestive process, and I did not care. My Grandpa and I had birthdays that were only 2 days apart, so we got to celebrate them together. I thought it made my birthday more special that we got to share our celebration. We always had our favorite things to eat at our party; we had potatoes two ways – first was Grandma’s famous potato salad, second was Grandma’s mashed potatoes, watermelon, and oven fried chicken in a cast iron pan, oh my goodness my mouth is watering just thinking about it. Grandpa and I would always get the honor of finishing off the mashed potatoes and gravy, there were NEVER, any left over potatoes. And of course we would have cake, Grandma would make two cakes one for each of us, Grandpa had german chocolate and I had angel food and always with a big huge dollop of homemade ice cream. Grandpa Pike loved to just drive around; we would look at new developments, christmas lights, we would drive the back roads and check on old property associated with the family, we would drive to threshing bees and visit family. What he really liked to drive around and see was what he called the local “remuddling” jobs. Grandpa would find do-it-yourself remodeling jobs and would drive by and critique their progress. He would even sometimes stop and give advice on how to proceed. I never thought about it then but he was always received well when he would stop and offer advice. I often wonder how that would go over today. He would generally make a new friend out of the encounter, another gift my grandpa gave me, the ability to make and sustain friendships. I have been thinking lately about how I became the person I am today. What formed these ideas and values that I hold onto so tightly and who inspired me to develop into the person I have become. I realize I am my own unique being, but I liken my own development to the landscape you see today, it has its own intrinsic qualities which have been shaped and cut and colored by all the environmental forces that touched it. Who I am today, who you are today, is a person that has been shaped and cut and colored by all the people and experiences in our lives. I was thinking about how I learned certain skills or traits from so many people in my past and how grateful I am for those lessons in humanity and love. I learned some pretty great things from my Grandpa, he was only in my life for 18 years but I learned so many life lessons from him. I wanted to honor him for all the tools that marvelous carpenter from South Dakota provided me in my tool box of life. Was my Grandpa perfect? Of course not, none of us are, we are all human beings and flawed. We have a choice in this world, we can focus on what we love about people or what we don’t love about people. Grandpa taught me to see what I love about people, pretty awesome for a country boy from South Dakota. So here’s to my Grandpa Pike who left a legacy of love, respect, innovation, and family values. Posted on August 12, 2012, in Humor, Life, Spiritual Journey and tagged american pickers, carpenter, fishing, grandfather, Grandpa, grandpas, Northern Pike, Pike, Pikes Peak, threshing bee. Bookmark the permalink. Leave a comment.